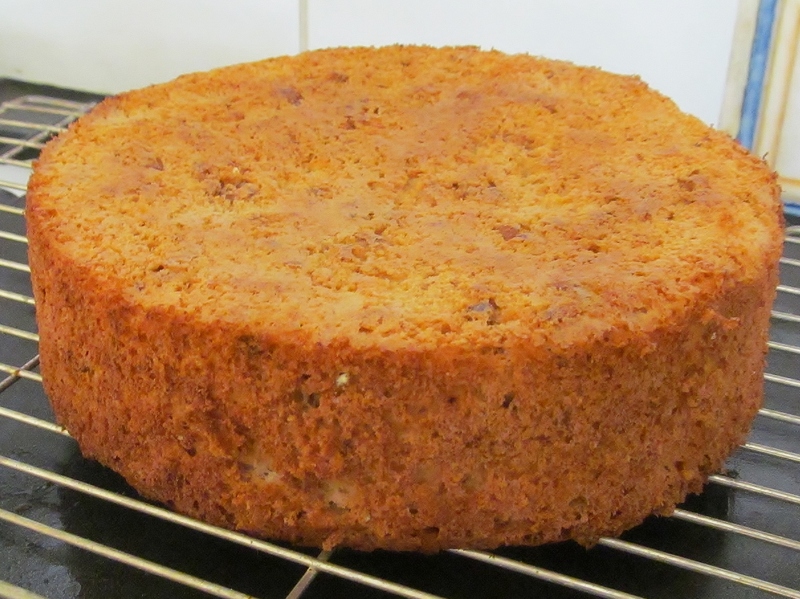 Week seventy three and I should heed my words in a recent blog- read the recipe fully and carefully before attempting the bake! 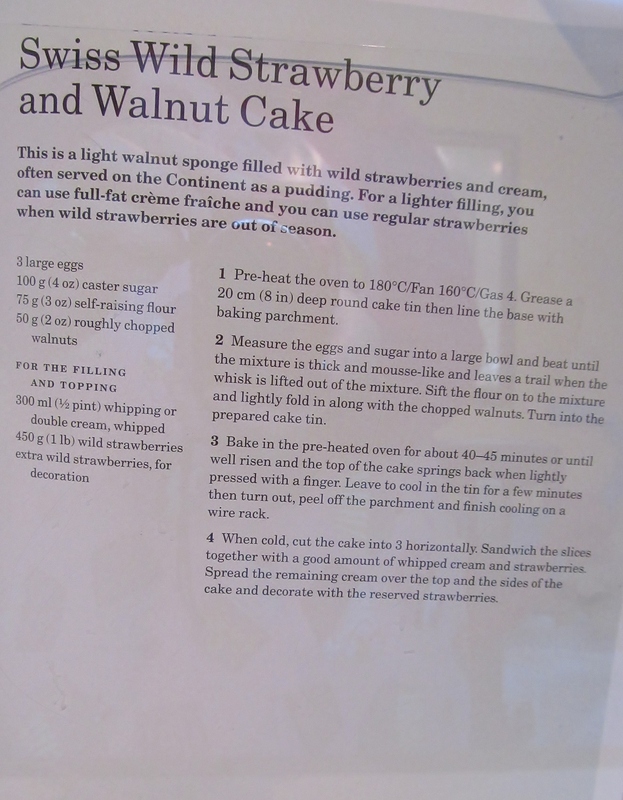 I dipped into Mary Berry’s Baking Bible and found the Swiss wild strawberry & walnut cake which sounded lovely. Stupidly I weighed everything into a bowl and mixed it and turned it into the tin as I kind of assumed that Mary’s recipe would be her usual throw everything in a bowl and mix affair- how wrong I was- but I ended up with a rather thick pancake! So take two- Mary Berry’s Swiss wild strawberry & walnut cake – even though hubby was trying to persuade me to leave the walnuts out. After CAREFULLY reading the recipe and begging three eggs from my other mum, I put the three eggs in a bowl with the sugar and whisked until mousse like and thick, leaving a trail. Then fold in the sifted flour and walnuts. Put into the tin and bake for 45 minutes. This time the cake rose but despite being on the right temperature for the full amount of time and the oven door not being opened, it still rose less in the middle. But it was 100% better than the last effort. When cool, Mary asks you to slice the cake into three- with trepidation I grasped the knife and made my first cut. 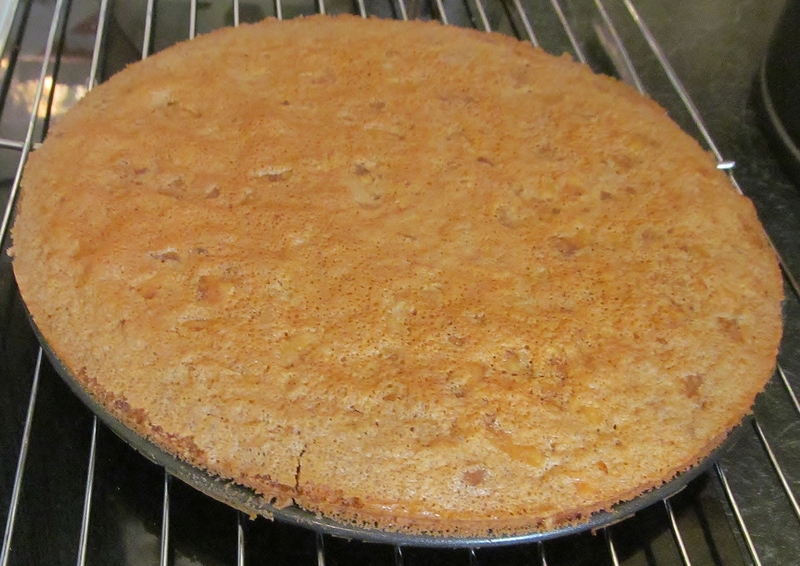 The top layer came away quite easily as there was a slight crust on the top but the next cut was harder as the sponge is very light but I managed it. In my local Morrisons I found a box of Spanish strawberries which looked heavenly and when I opened them , they smelled amazing and tasted just like strawberries from my childhood. 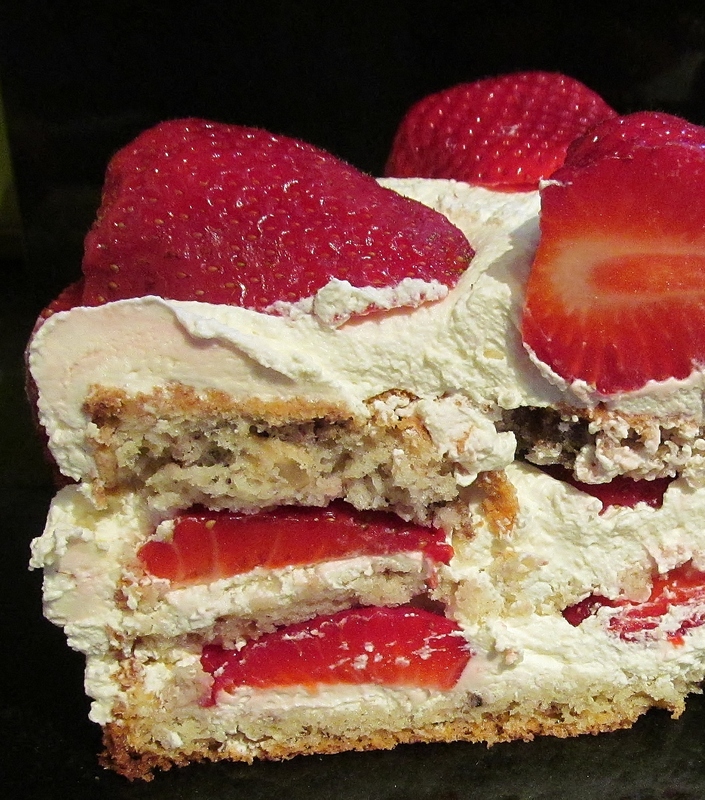 I whipped double cream until it was nice and thick and spread cream onto each layer with some strawberries and finally the cream spread over the top and sides and finished with more strawberries. The second bake I had left for a while as I had watched with amusement the contestants on the last Great British Bake Off making tuile biscuits with varied results . 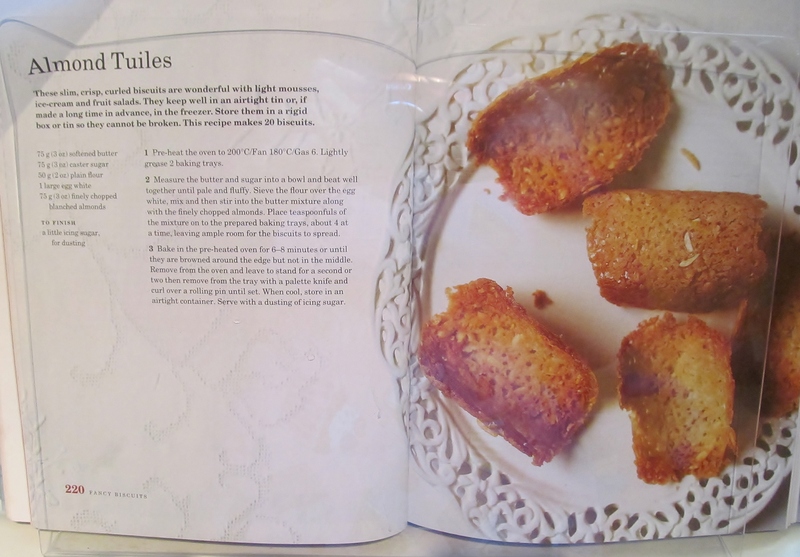 The almond tuiles recipe was rather bizarre in that you creamed the egg and sugar together. In another bowl, add the egg white and mix the flour in. What Mary doesn’t tell you is that it goes like glue! Then mix all the ingredients together including the chopped almonds. Mary then asks you to put a teaspoon of the mixture onto the baking tray- she suggests four spoonfuls on each tray to allow for spreading. Only bake four at a time and this is really important. 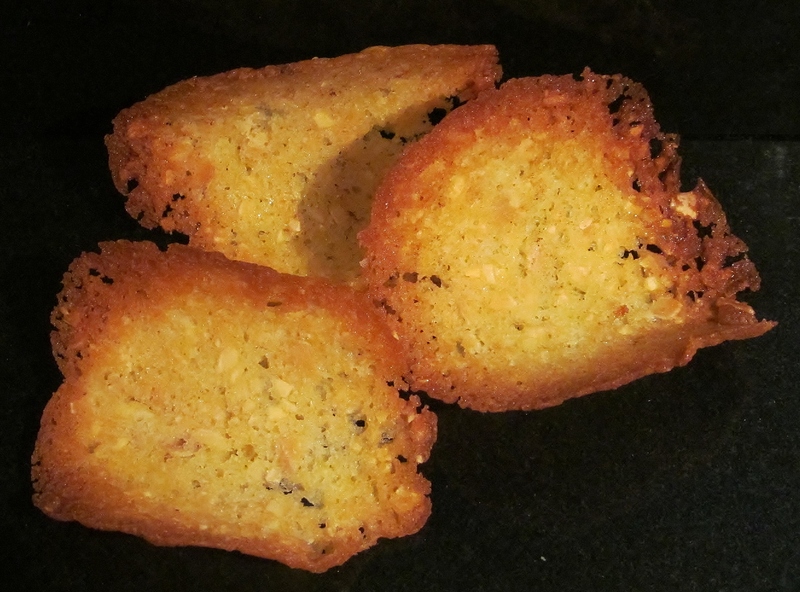 Bake them until they are brown around the edges but not the middle. Remove from the oven, time is of the essence here. Allow to cool for a few seconds and use a spatula to lift and drape over a rolling pin to create the curve. Allow to cool on this before putting on a rack for final cooling. I was pleased with my tuiles and the curves I managed to get! I usually listen to music while I am in my own little world baking in the kitchen. I can become a bit of a sports widow while there is rugby or formula one on and baking is a good way of filling this time. I have been listening to Robbie Williams album “Swings Both Ways “ and its brilliant. Such an eclectic mix of music, quite different to his normal style and I can highly recommend it. He is no Michael Buble (sigh…) but he has certainly given him a run for his money with this album! Oh, and the countdown now stands at T – 122 recipes left to go…. This entry was posted in Kim's cake challenge and tagged almonds, double cream, Kim's Almond Tuiles, Kim's Cake Challenge, Kim's Swiss Wild Strawberry & Walnut Cake, Mary Berry, Mary Berry's Almond Tuiles, Mary Berry's Baking Bible, Mary Berry's Swiss Wild Strawbwerry & Walnut Cake, strawberries, tuiles, walnuts, Whipped cream by kimsideas. Bookmark the permalink. 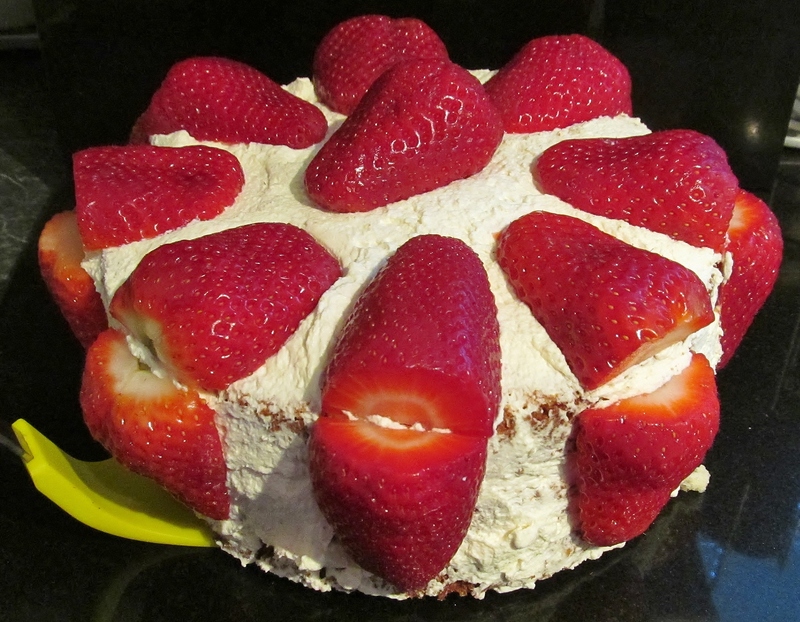 Strawberry Gateau, just in time for supper. WoW really enjoyed that one. Tuilles will accompany some ice cream to-morrow. As for the cheese scones, not on the schedule but definately indulging your “Official Taster” I have those soundly earmarked for breakfast!!! Had a peek in the tin and they smell wonderful.